According to the article, an elderly woman in Spain, no doubt possessing a good heart and trying to be helpful, painted over "nearly all of [the] original brushstrokes" on a damaged fresco by 19th century Spanish artist Elias Garcia Martinez. Although the article tagged the overpainting as a "hilarious failed attempt," I found it simply painful. 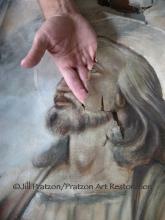 For those of us who care for paintings professionally, as well as collectors and art lovers, it is far from hilarious. 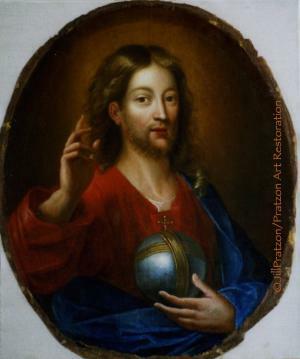 After reading the article, I was happy to dive back into the restoration of the portrait of Jesus by Emilio Parisi (shown here), which happened to be sitting on my easel. Perhaps this painting is not as valuable in dollars as the Martinez, but it is definitely important to my client, the artist's granddaughter. 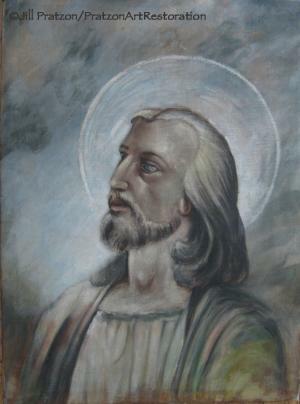 I finished the necessary restoration today, but it reminded me of another portrait of Jesus I cleaned several years ago. My client knew little about the painting (pictured at right), but he asked me to clean it and line it to new canvas since it was fragile and flaking. After I gently removed the grime and varnish, many small losses were revealed. Restraint is always needed when in-painting loss, so the only areas I replaced were those where original pigment was actually missing. Daily, I am faced with paint loss. Sometimes the loss is substantial, as with the Parisi, but the rules don't change with smaller losses. While I am saddened that the elderly woman's misguided attempt to help has likely brought her ridicule, I am glad the article sheds light on the need for judicious, conservative in-painting.